Many Christmas traditions aren’t Christmas traditions, but derive from Saint Nikolaus Day in Germany. Craning his neck around the other children, Aaron searched for just a glimpse of the man in the red suit, his ticket to the coolest toy this season: Santa Claus. 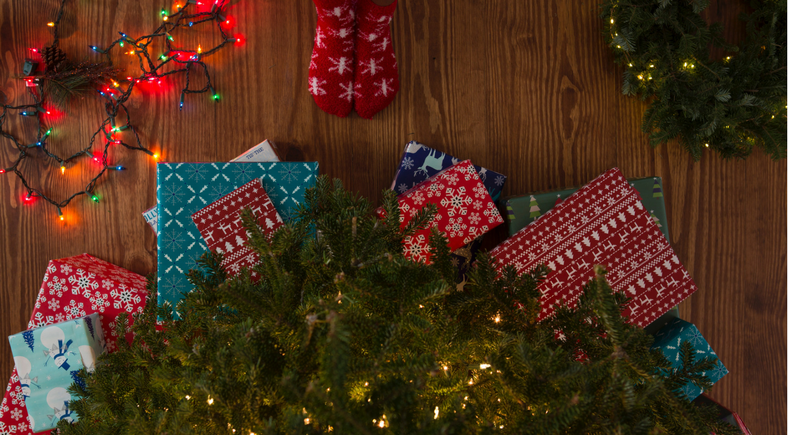 On Christmas morning, he’ll wake up to beautifully wrapped presents under the Christmas tree. Why? He doesn’t know, because to him it’s just Christmas. Saint Nikolaus is the original version of Santa Claus, based on a German-celebrated Turkish bishop known for his generosity. Unlike Santa Claus, Saint Nikolaus doesn’t drive a sleigh or come down the chimney. In the German tradition, he walks straight in the front door and asks the children whether they have been naughty or nice, looking in his big golden book to read a record of the children’s behavior (as provided by the parents). Saint Nikolaus Day is celebrated on Dec. 6, but on Dec. 5 German children celebrate by placing their freshly cleaned boots outside their bedroom. Saint Nikolaus – who is usually played by a family friend – leaves a sweet treat such as chocolate, fruit, or nuts in the boots of good children. His assistant, Knecht Ruprecht, has a sack of coal on his shoulders and puts a piece in each naughty child’s boots. The tradition of Saint Nikolaus bringing the children toys was put on the back burner during the Reformation, when worshiping saints became increasingly unpopular. The idea of gifts coming from the Christkind (Christ Child) emerged, which is how Kris Kringle derived his name. This blending of Saint Nikolaus Day with religion is when it started to take over Christmas. The tradition of Saint Nikolaus and Knecht Ruprecht’s visits eventually came back and, along with many other German customs, made its way to the United States. Another custom that Americans adopted is the Advent Calendar, which counts down to Saint Nikolaus Day with a little door hiding a chocolate for each day. The advent wreath, one of the biggest Saint Nikolaus Day traditions, sits on the living room table the fourth Sunday before Christmas. The wreaths have four large candles, and families turn off the lights and gather around the wreath for one hour, where they spend time together and watch movies. They light a candle every Sunday before Christmas until all four candles are lighting the room, which – in the most traditional households – is when they reveal the Christmas tree. The Christmas tree is originally a German tradition, which started with families decorating their house with evergreen branches, then evolved into bringing a whole tree into the house which they decorated with red apples, gingerbread and silk flowers to make it look like the tree was blooming in winter—a miracle. Christmas is a season of miracles, after all. Around 19th century, the Christmas tree replaced the nativity scene, which was the start of the commercialized Christmas and mutilation of the Christian religious holiday. The first documented Christmas tree in a United States home was in the early 1840’s. Charles Minnigerode, born in Germany in 1814, set sail for America in 1839 and became the professor of humanities at the College of William and Mary in 1842. He met Judge Nathaniel Tucker in Williamsburg, who he spent Christmas with. He told Tucker’s kids about German tradition, got a small pine tree, and showed them how to decorate it. He helped the children get candles and make paper balls and popcorn garland to put on the tree. The next year, many Williamsburg residences contained a Christmas tree, and German Christmas traditions spread from there. Today in America, citizens celebrate many Saint Nikolaus Day traditions brought over with immigrants like Minnigerode, such as the legend of Santa Claus and his naughty list, Christmas trees, wreaths, advent calendars, and many more.